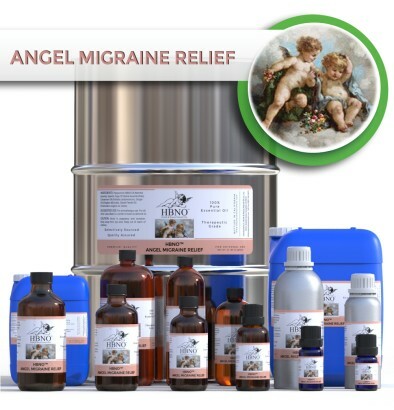 HBNO is pleased to offer HBNO™ Angel Migraine Relief blend in small packing to bulk and wholesale quantities. We can supply any amount of oil to anywhere in the world. We can also formulate according to your needs to meet your target price for bulk quantities. Sage is an exquisite oil. Its unique scent is alluring, capable of being applied as a cologne or perfume, as the aroma is androgynous. It is currently being researched for its promising effects on memory retention and combating dementia. It is also considered to act as an antibiotic, antiviral, antifungal, astringent, anti inflammatory, and antispasmodic agent. The fragrance is to die for, unlike any other sage you have savored. An HBNO favorite. Ginger essential oil is considered to be a powerful nerve tonic, good for exhaustion and mental fatigue, and best used in combination with other oils. It is also aids with congestion, colds, coughs, bronchitis, excess fluids, swelling, spasms, fever, headaches, arthritis, sprains, bruises, soreness, poor circulation, varicose veins, raised body temperature, toothache, and is a renown for its ability to combat nausea. Its analgesic properties help with reducing pain from muscular aches, arthritis, sprains, rheumatism, joint, pain and stiffness. It has also been used since antiquity as an aphrodisiac, improving libido and impotence. Chinese medicine has employed fresh and dried ginger for the treatment of fevers, coughs, and nausea. Ginger spread to Europe in the Middle Ages and is said to been used to combat the Black Death due to its ability to make a person perspire. Fennel is a tall, feathery Mediterranean herb that thrives adjacent to the sea. It has a taste and smell similar to licorice. The early Greek athletes ate the seeds to increase strength while training for the Olympics. It has long been considered anti toxic by the Chinese and Europeans. Fennel essential oil enhances complexion, especially for lackluster and mature skin. It is warming and improves circulation throughout the body. It’s astringent properties help to reduce cellulite and tone the skin. It helps to reduce obesity by inhibiting appetite and helps with indigestion. It also has estrogenic hormonal properties which stimulate the adrenals. Fennel essential oil is antibacterial, antifungal, antiphlogistic, antiseptic, antispasmodic, antitoxic, aperitif, appetite, astringent ,calmative, carminative ,decongestant, depurative, detoxifier, diaphoretic, digestive, diuretic, emmenagogue, expectorant, estrogenic, hepatic, insecticide, parasiticide, regulator, and is revitalizing.